Ask fellow campers about "Hapgood RV Park" and nearby attractions. My rating of a "5" may be a little harsh. This is a city park and I commend Henrietta, TX on their building a well layed-out, all pull-through campground with full hook-ups. Having a sewer connection in a city park is a rarity and I really appreciate it. There are twelve sites and we heard that at least a couple of them have 50 amps but of the six I looked at before pulling into one, all were 30 amp. I think a pro/con list would be more helpful and quicker to read than a narrative. Tall rigs need to exit Hwy 287 at Hwy 82 intersection and go through town to access the 510 loop to the park. The closest exit on 287 will take you under a low (14') railroad trestle. If you are in the 13'6" range I would not trust the clearance. Power pedestals are not RV-grade, look like the cheapest breaker box they could find and stick on a piece of pvc pipe. Power is not good; we rarely got through an hour without voltage dipping below minimum and causing our power management system to block the potentially harmful effects. This appears to be an ongoing problem as all six of the pedestals I looked in had melted plugs or charred metal around newly replaced plugs. I really like this park for a night's layover but I would have to think twice about staying again though because of the power. We camped at Hapgood RV Park in a Fifth Wheel. Closest access to Hwy 287 requires passing under a low, 14', train trestle. Any rig approaching 13'6" in height should use Hwy 82 exit and pass through town to connect to the 510 loop to the park. A city park with 12 pull thru sites. Some shade, but full hookups. OK for an overnight or couple of nights stay. There were 4 others there that appeared to be living there while they are working in the area. Be sure and check the electrical box. Some are 50 amp only and others are 30 amp only. Ball fields nearby, so plenty of room to walk your pets. 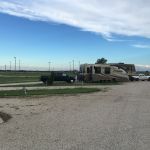 We camped at Hapgood RV Park in a Motorhome. Are you affiliated with Hapgood RV Park ?